What Does a Curriculum Specialist Do? Curriculum specialists support schoolteachers by developing and improving the instructional materials for courses. They may also give constructive feedback on how teachers are implementing those materials and how effective the materials are. Most curriculum specialists work for elementary and secondary schools, colleges, professional schools, educational support services, or state and local governments. Sometimes curriculum specialists are called instructional coordinators or instructional specialists. Participate in or facilitate curriculum review committees. Select textbooks and other instructional materials for districtwide implementation. Set expectations for which parts of the curriculum must be covered within the school year. Stay informed of trends in instructional methods and educational technology. Assist teachers in incorporating new technology into their lessons. Provide feedback to teachers based on individual observation and student performance data. Use data to monitor district performance in meeting externally imposed standards. Write grant proposals related to curriculum and instructional matters. Unlike teachers, curriculum specialists usually work year-round and don't have summer breaks. Curriculum specialists usually need to earn a master's degree, get a teacher or administrator certificate, and have experience as a teacher. Degrees: Most employers require curriculum specialists to have a master's degree, preferably in education or curriculum and instruction. Candidates need a bachelor's degree to enter such a master's degree program. Some employers only require a bachelor’s degree to be a curriculum specialist. Certificates: Employers almost always require a state-issued teaching certificate. Some schools require a state-issued education administrator certificate as well. Experience: Employers often require curriculum specialists to have significant teaching experience because part of the job requires evaluating teacher performance using observation and data analysis. In addition, teachers may be more open to constructive criticism from someone who has years of classroom experience rather than someone with a predominantly theoretical understanding of the profession. 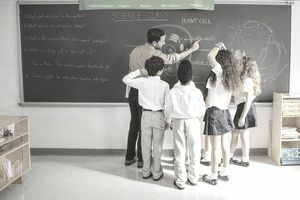 A district may divide its curriculum specialist positions by grade level or subject, so the district may require curriculum specialists to have experience in the grade levels or subjects they cover. Such divisions are more prevalent in larger districts than in smaller ones. Leadership: Curriculum specialists must be able to give guidance to and mentor the teachers with whom they work. Communication: People in this position must be able to clearly explain any changes in curriculum or instruction to teachers, principals, and school staff. Decision-making: Curriculum specialists must be able to confidently make informed choices about instructional methods and curriculum materials. Analytical thinking: Curriculum specialists must be able to evaluate student performance data, teaching strategies, and curriculum materials, and then make recommendations based on their analysis. According to the U.S. Bureau of Labor Statistics, the job market for curriculum specialists will likely grow faster than the average for all occupations, at a rate of 11 percent during the 2016–2026 period. Since many people in this position are employed by state and local governments, the growth of this job will also depend on state and local government budgets. Most curriculum specialists work in an office setting. However, they may spend a significant amount of time traveling to schools within their district or system to monitor instruction or conduct training. Curriculum specialists generally work full-time Monday through Friday, year-round (unlike teachers, who usually get summer breaks). Usually, the daily schedule for this job aligns with the general operating hours of the employer. Curriculum specialists may also meet with educators outside of classroom hours.